Whether you're just bothered a few hairs, or a lot of unwanted fuzz to remove, you've likely considered tweezing as your primary option. Tweezing is great because it's affordable and fairly quick. It also doesn't take any real particular skill to remove the hair, and can leave results that last for weeks at a time. What you need to know to tweeze well, is how to grab it easily, feel less pain and have longer lasting results. First off, grab a good pair of tweezers. This is your only tool, so you need ones that work well. If your tweezers are sliding off it's going to take you a lot more time to get the job done. Even worse is that often, a less than stellar pair of tweezers will break hair off before it's plucked. If hair is breaking above or below skin's surface instead of removing it out of the follicle, then it's going to show up days later instead of weeks, and could become an ingrown hair. The overall best pick is the Tweezerman Slant Tweezer. Their high quality and the fact that the slant easy adjusts to the curves of the face, allows the tweezers to get closer to the skin than they would have otherwise. 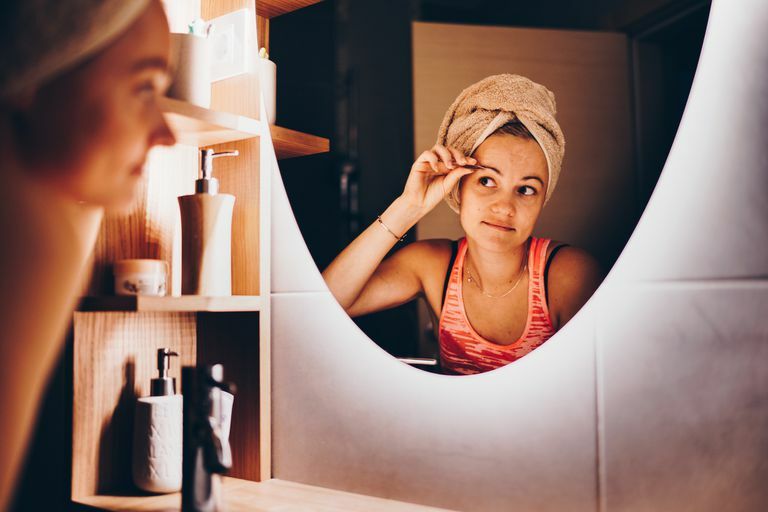 You will want skin nice and clean to avoid post hair removal breakouts, so wash your face before tweezing your eyebrows. The warm water helps relax skin and the hair follicles, so it's easier to pull hair out. If you exfoliate, now is the best time to do so. Exfoliating removes the build up of dead skin cells, which helps hair point up for easier removal. Wipe off and pat your eyebrows dry to remove moisture. If you're ever worried about pain, apply a numbing spray to a cotton swab or q-tip and run it across the area you are going to tweeze. You want to see your face clearly so you can get the best results. So when you do tweeze, you should be standing in front of a mirror with good lighting, coming from the front. Natural lighting, like a mirror by the window while it's sunny outside is the best—you'll be able to see each and every hair. That's why you find "hidden" hair when looking in your car's mirror. Hold your skin firm with your free hand, and use your tweezer to grab onto your hair as close as you can to the skin. Make sure to remove it in the direction that it grows. Begin with only the thick, dark hair first and see if that does the job. If the finer hairs are still bothering you, then remove them too in the exact same way. Don’t dig tweezers into skin if you can't grab the ultra short hairs. You just have to wait until they grow out, which could be only a day or two. By gently holding skin taut with your free hand while tweezing there will be less tugging. You want the least amount of pulling, because it's the one of the main causes of pain when removing hair. You also risk scraping skin if you dig in, which can cause scabs or dark spots. If you're having a hard time seeing the hairs, apply a little baby powder to the area and they'll be more noticeable. While you're working, dust off your eyebrows with a towel occasionally to keep the place clean and clear. When you're finished, apply your facial toner or some alcohol-free witch hazel. This helps to prevent pimples and irritation. You can also apply your favorite facial moisturizer with a cotton square to keep skin looking soft. Ingrown hairs are also less likely to plague moisturized skin, especially where the hair is thick like on the chin.